It's always a red-letter day of happy dancing when I finish a piece that is not a class model! Water, the first in a series of four samplers on the Four Elements by Thea Dueck. This graphic appears with Thea's permission. Fire, the second in the Four Elements samplers by Thea Dueck. I changed the colorway a bit to make it a little "less red," as I want to frame these and hang them in a group. This graphic also appears with Thea's permission. I've finished Air and have nearly finished Earth (only the Hardanger remains). Come back! 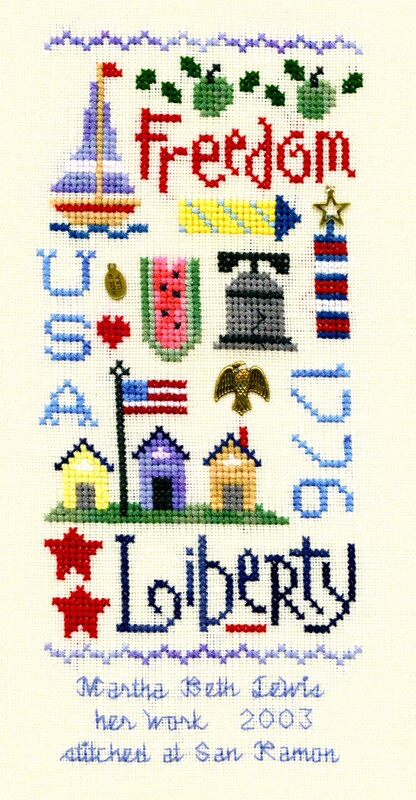 This is the sampler I stitched for 9-11. When I was at my mom and dad's in August, I finished the project I had taken along (Thea's Fire). I couldn't bear not to have something to stitch every afternoon while my mom plied her own needle. She and I rifled through her fabric and patterns, and I chose this little one. I made good progress while there, but had to set it aside when I got home. During the 9-11 horror, I spent days glued to the television and weeping buckets (as I imagine many people did), and it was so soothing to have a needle in my hand. During that time, I stitched the border, and I am truly shocked that it connected. This design, a shop freebie by Heartland, appears here with the permission of Wichelt Imports, Inc.
Nancy Sturgeon's Blue Star is on 40-count silk gauze. It originally had a house in the center bottom, but I was feeling arbor-ish, and so I replaced that with a tree. I want to tell you how much jolly fun it was to start and stop the thread for each letter!!! (Next time I do an alphabeth on 40-count, you can be sure I'll be filling in the background!) This appears with the permission of Nancy Sturgeon, who swears to me she's going to get her webpage up "soon." Meanwhile, email her about a catalogue. Sandy Vanosdal has given me permission to post the numerous designs of hers I've stitched. (Most given away.) Please come back for these. 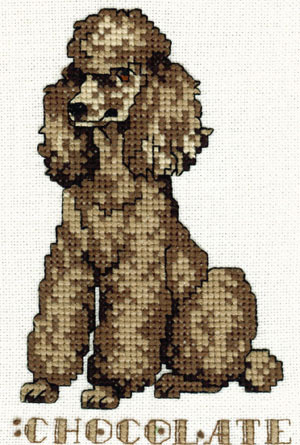 Linda Gillum gave me permission to post this poodle design from her "America's Best Loved Dogs" (copyright 2000 for Leisure Arts). The cover shows an apricot poodle, but I've changed the colors to match my brown one. The "portrait" looks uncannily like my poodle, Chocolate! Celtic Drawn-Thread Sampler. This sampler started life as Jonalene Gutwein's "Drawn Thread Sampler #1," a Group Correspondence Course through EGA, but I made so many changes that it really does not resemble the original at all. 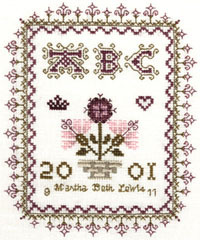 The celtic motifs are from Mike Vickery's "Celtic Cross Stitch" (ISBN 0-8069-1382-7) and appear here with permission. The rest is mine. 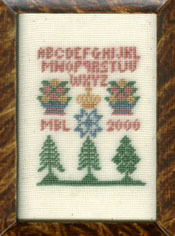 One of my earliest pieces were a pair of samplers for my parents, based on the "When I am an old woman, I shall wear purple" poem by Jenny Joseph (1961). I changed the text to suit each of them. This sampler is a pot pourri of motifs from Cross Country Stitching magazine (Jeremiah Junction). I added a few of my own and gave this to my mother, who enjoys Shaker and Amish things, including dolls. As she would say, it "made up real cute." This one is "Liberty Spots" from The Trilogy. 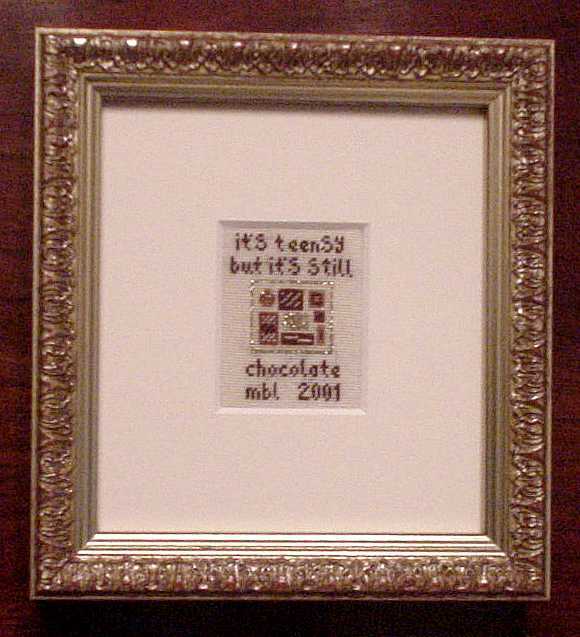 I got the frame at a stitching festival - - it was designed to house this project. Naturally, I had to have it, too! I had bought the chart not 30 seconds before I spied the frame, and so I went right back to the cash register! 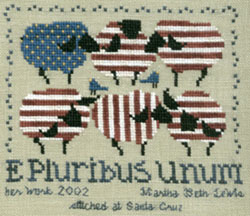 Here is Vicki Hasting's flag made from sheep. I love flags, so when I saw this design, I had to have it. It's leaflet #199, and your shop can order it. This piece appears with the permission of Cross-Eyed Cricket. The company says their webpage is coming, too. I thought I had chosen 28-count linen from my stash, but when I started stitching on it, it became clear (duh!) that I had chosen 36-count instead. Thank goodness for lighting and magnification! More flags! This alphabet one is another by ?The Trilogy and is called Happy Flag Day. Flags and alphabets! Can't get much better than that! This little piece is titled "June Zooms" (Bent Creek), but when I saw the suitcase, I knew it was for my sister and her husband, who travel almost constantly. True to my tradition, I made some changes (though I kept the snaps, which is what first attracted me to the design! ): I put their favorite cities on instead of some that the chart called for and changed the text, of course. 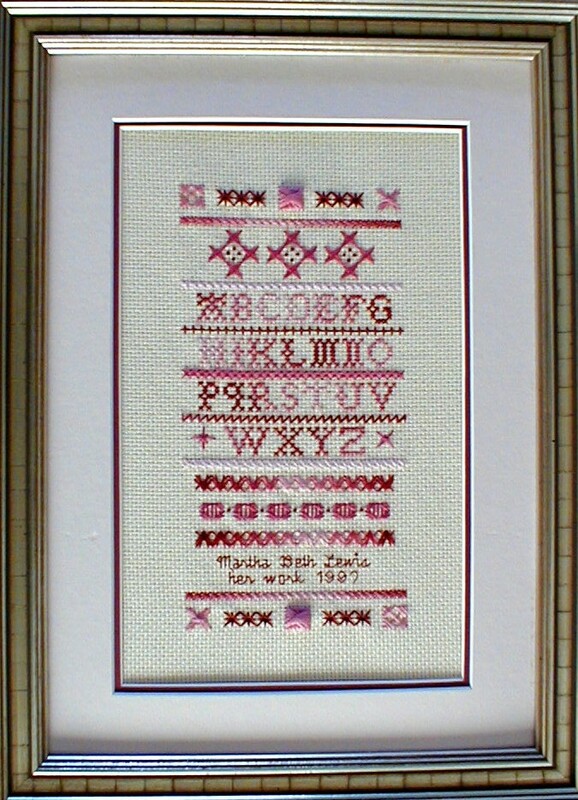 Here is a sampler I designed for a notebook of stitches class at a cross stitch festival. It's online, so I thought I'd put up a link. Here's another sampler for a notebook class from a festival. This is a silk gauze sampler for another festival year. 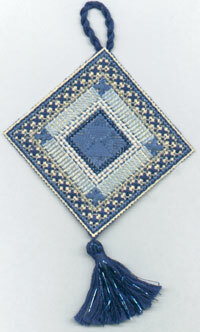 Here's another class project, this one an ornament from my popular "Encyclopedia of Cross Stitch." It uses threads and stitches taught in class. It fits on a standard 3" x 3" piece of perforated paper. Superlative Tatting Words fail me! My Infamous @ Nametag (You can get Sarah Newberry's free chart for this on Kathy Dyer's home page.) This was stitched way before I figured out how to avoid stripes when stitching with space-dyed thread! Really hideous project! !